The pain and jaw dysfunction associated with Temporomandibular Disorders (TMD) can impact your ability to chew and swallow food. 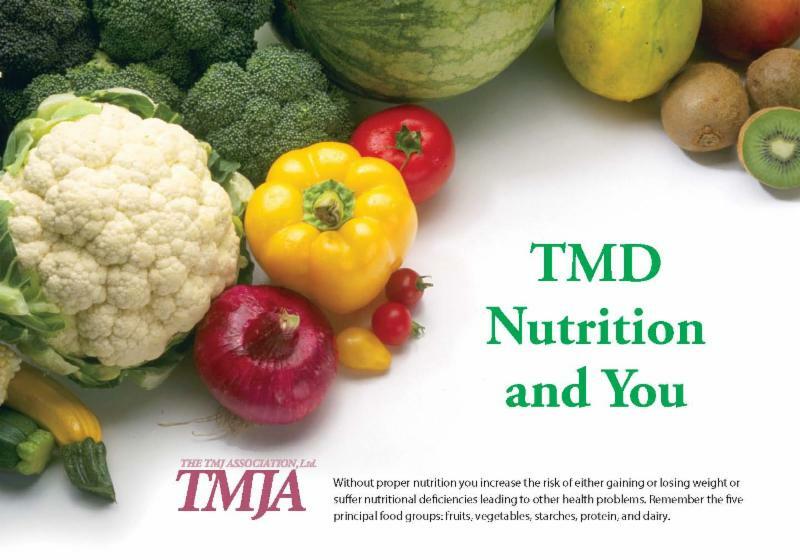 How and what you are able to eat can seriously compromise your nutritional and health status - an aspect of TMD that is often overlooked by both patients and health care providers. "...Eating fruits, veggies, and health foods tend to be very hard on my jaw; I can get a headache just from eating an apple or a few carrots. I would much rather sit around and eat mashed potatoes and not hurt..."
"...There are days I am so hungry, but I know the price I will pay if I 'chew' the wrong foods..."
"...My daily food choices are very limited, due to the possibility of my jaw locking up while chewing crunchy or chewy foods..."
With their expertise, we developed, "TMD Nutrition and You," a nutritional guide booklet specifically developed for people with compromised oral function to help them maintain a healthy diet in spite of their oral disability. Click here to download a free copy of our booklet. Please consider a tax-deductible contribution to The TMJ Association. As a nonprofit organization, we rely upon your contributions to carry out projects like this to help improve the lives of those we serve - TMJ patients.